The history of the Cork Union workhouse on Douglas Road is well documented (now the site of St Finbarr’s Hospital). The archives of the Cork Board of Guardians in Cork City and County archives are extensive, and include a large numbers of minute books, that record the proceedings of the Board’s meetings, 1841 – 1924. Many subjects are recorded in the minute books, such as the ongoing struggle to both fund, staff and manage the workhouse and related services, attitudes to poverty, developments in public health provision, and the care of the infirm, the destitute, children, and the mentally ill. Such subjects are also fleshed out and debated in Cork newspapers of the day, such as the Cork Examiner, which published the minutes of meetings as far back as 1841. Continuing the thread of exploring life in Cork one hundred years ago, like many other institutions in the city, the year 1917 for the Cork Union House coincided with continued cuts to service provision due the ongoing war. 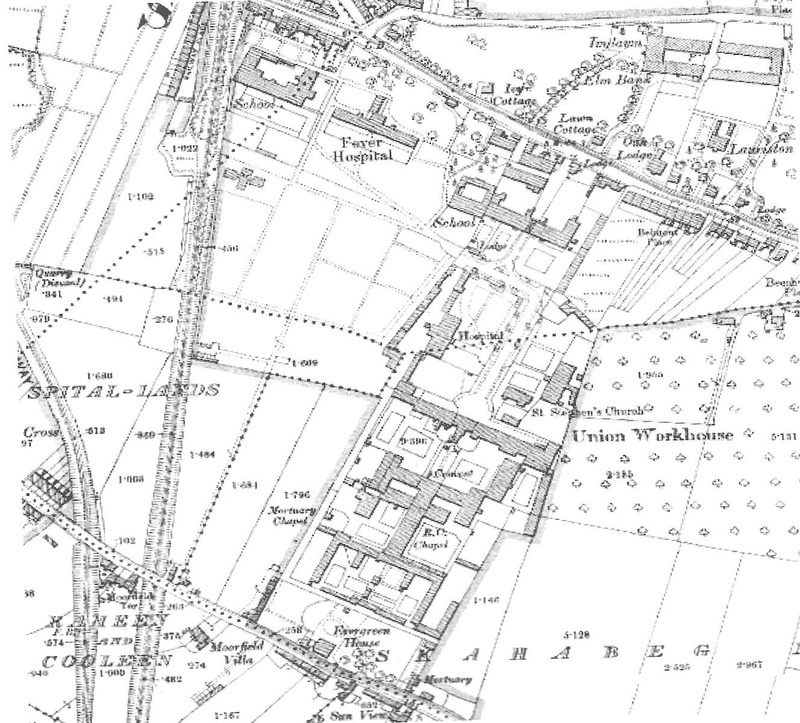 The old workhouse site provided an array of public services from accommodation, food, schools and hospitals. By 1917 the term workhouse had been renamed Cork District Hospital. At a special meeting of the Board of Guardians on 15 January 1917 salaries and cutbacks were outlined. There were men in their employment who were working for less than labourer wages. Urgent repairs were only to be pursued. The price of food was at such a level that a further increase made securing such goods prohibitive for relief. In January 1917, the provision of tobacco or snuff was to be minimised. It was proposed that milk be substituted for eggs. The consumption of coal in the institution was deemed too high with the cost in the summer the same as in winter. The butter bill was an enormous one. Other public boards had substituted margarine. As to the scarcity of sugar, they proposed to utilise condensed milk to sweeten teas. Attention was brought to the question of the three distinct lines of telephones in the institution– and that one ought to be suffice. At the meeting of the Visiting Committee on 2 May 1917 officials spoke about being refused a war bonus because they were receiving rations. The meeting saw further cuts in rations. Unmarrried officials were to be cut but the difference made up in cash to them. Two shillings per week more were paid to dispensary porters. At 16 May meeting, the engineer’s report, which was read, highlighted that the cost of building materials had increased fifty per cent and timber was coming in 100 per cent dearer. It was impossible to fully carry out the ordinary repair work needed with a small staff contingent of seven painters and two masons. In mid-May, the figures in the media revealed a large operation programme and the debate at meetings gives insights into the scope of the Union House and its complex. There were 1,450 people in the House (102 less than the figure for 1916). In the hospital, there was 980 patients in the hospital (45 less than the figure for 1916). The deaths during the week ended 5 May amounted to ten. The numbers of persons in receipt of outdoor relief totalled 1925. The daily supply of milk required totalled 182 gallons. It was bought from two sources – Mrs Hannah Forrest of Clogheen and Mr F Bradley of Carrigrohane. The tender of James Murphy of Nicholas’ Well for ten pigs at £112 was accepted. The wages of the bakers in the house were increased to the standard operating in the city, as were those of the carpenters and the fireman of the house. At the mid May committee meeting, the Ladies Boarding Committee was proposed to be dissolved – it had been established 30 years ago for the specific purpose of looking after young women with regards to giving them access to the site and improving their health. At the Board of Guardians meeting on 29 June 1917, complaints were read from the Federation of Trade Unions of Cork and District Health Insurance Society as to two of its members and the treatment they received as patients. It was acknowledged that there was a prolonged delay at the porter’s lodge with formalities and restrictions. A custom existed that all patients had to undress at the lodge All no matter what they were suffering from were to seen by the medical officers. Deputy attendants was deemed not conducive to the sympathetic treatment of patients in the hospital. The shortcut solution for many years was to propose the appointment of paid attendants but the expenditure was high so probationer nurses were appointed. At a Board of Guardians meeting on 21 September 1917, further insights are revealed. The Clerk of the Cork Union was manager of the schools – the number of girls in the female school was 51 whilst the teachers numbered 5. In the boy’s school there were 41 pupils and 3 teachers. In the Fever Hospital, there were three nuns, two probationers by day and one night nurse, and one paid wardsmaid and one inmate. There was a six-month fever course in the Cork District Hospital. Dr D Horgan of 11 Sydney Place, Cork was appointed eye specialist.